Whether you’re an experienced triathlete looking for Ironman or half Ironman training, or a novice at any distance our team of highly experienced professional triathlon coaches can ensure your specific coaching and training needs are met at our SunTri triathlon training camp. The SunTri triathlon training camp is based at the Valentin Playa de Muro hotel a unique training camp setting on the edge of the Albufera nature reserve and Las Gaviotas Suites in central Playa de Muro. Our Valentin hotel location offers individual bungalow lodges just 200 meters from the Playa de Muro beach with white sand and crystal-clear calm waters surrounded by pine trees and dunes and only 500 meters from the town of Can Picafort. 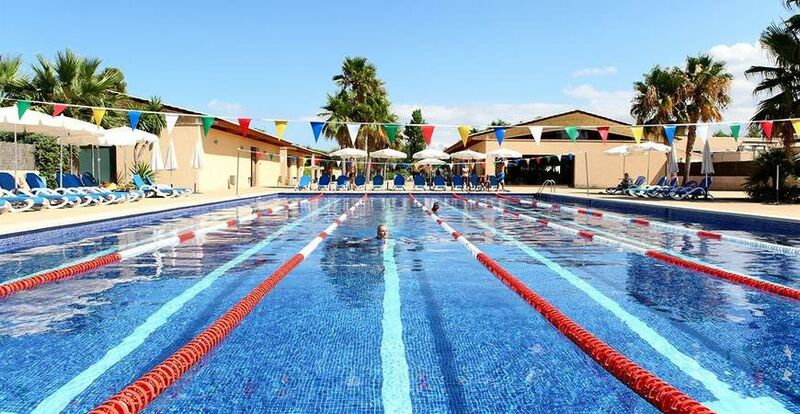 A triathlon training camp location that provides a heated competition training pool, close to quiet flat country trail running routes and surrounded by some of the best cycling training terrain in Europe. The Mallorca 70.3 Half Ironam is one of most popular long course races in Europe and we often use parts routes used in this event to train and coach our Ironman and triathlon camp attendees. A significant benefit of joining a SunTri triathlon training camp is you have the option to join up with the different level SunVelo cycling groups that run each day.